While on the rise, Garmin’s still not quite there when compared to the truly elite teams in the sport. There’s enough potential on the roster to easily make Jonathan Vaughters’ squad one of the top five or six in the world, but until we start seeing more wins we’ll have to be satisfied with just wondering “what if”. Of Garmin’s potential big hitters, Tyler Farrar has the best chance to launch the squad into the big time. Perhaps no other rider showed more steady improvement throughout 2009. Tyler started the year with a win in Tirreno-Adriatico, before contesting the bunch sprints in the Tour, where he was a consistent top-5 finisher. August was his finest month, bringing wins in the Benelux Tour as well as the Hamburg Pro Tour event. The year ended with stage wins at Franco-Belge and of course, a win in the Vuelta. All in all, these were solid results—a season well done. Now though, it’s time for Farrar—and the rest of this relatively young squad—to take the next step. A win in one of the monuments would start things off on the right foot. Farrar will certainly come to Milan-San Remo and possibly several of the cobbled classics (especially Ghent-Wevelgem) as a favorite. With the experienced support of men like Julian Dean, Ryder Hesjedal, Martijn Maaskant, Johan Vansummeren, and Matt Wilson, Garmin could even be an outside player at Roubaix. From there, the Grand Tours beckon, a place where the departure of Bradley Wiggins will certainly be felt. Christian Vande Velde has placed well in the last two Tours de France, and will continue to lead the team while younger riders like Daniel Martin gain experience. For Vande Velde, a top-5 in a fully-stacked Tour would be a terrific result—especially if it comes with a stage win (from anyone), and is perhaps at least one spot better than Wiggins (revenge is dish best served in July). Garmin’s wild cards are David Zabriskie and Tom Danielson, two riders known for the sharp contrasts between their highs and lows. When going well, both have the ability to dominate their given disciplines; however, sickness, crashes, poor judgment, and just plain bad luck seem to target these two just when they appear to be hitting their stride. Perhaps 2010 will be the year they put all the bad voodoo behind them. Man of the Hour: Tyler Farrar is America’s best chance for a win in a major classic since George Hincapie—America’s other best chance for a win in a major classic. Farrar’s got the team he needs for success. Should he strike out this spring, he’ll have the Tour to make amends, but the odds are bit longer there, as Mark Cavendish seems pretty unbeatable. On the Hot Seat: I’ve said it once and I’ll say it again, this year has to be Tom Danielson’s last chance to prove he’s worth keeping around. He was on track to end last season on a high note before succumbing to a stomach virus in the Vuelta. He’s started 2010 well with some promising showings in France. If he can pull it together in time for a top-10 finish in the Giro, he might earn his place on the Tour team in July. And from there, it’s anybody’s guess. Up-and-Comer: Sometimes I wonder if Jonathan Vaughters spends more time thinking about the future than thinking about the present. That said, the signings of Jack Bobridge and Michael Kreder insures the strength of the squad over the next 5 years. Bobridge tore-up the track a few weeks ago in Australia and deepen an already strong time trial squad. Kreder’s performed well this past weekend in the Tour du Haut Var. Best Pick-Up: Johan Vansummeren will prove worth his weight in gold by mid-July. He’s a rouleur in every sense of the word—a proven performer on the pavé, he can sit on the front of a group for hours, slowly tapping away at a break’s lead. If Garmin wins both Roubaix and a Tour stage, I bet they’ll owe it all to this guy. Biggest Loss: Bradley Wiggins might not do better than his 4th place in the 2009 Tour, but his presence certainly helped Christian Vande Velde (sometimes 2 heads are better than one) as well as Garmin’s TTT squad. While Vaughters made the right choice in letting him flee to greener pastures (his price was too expensive), the squad lost some depth as a result. Garmin’s 2010 program was one of the longest in the sport, stretching from January’s Tour Down Under through the Japan Cup at the end of October. Along the way, there were several highlights—and several disappointments—for the mean in blue and orange argyle. Garmin’s first highlights of the season came in Belgium with Tyler Farrar’s third-place finish in the Omloop Het Nieuwsblad, the traditional opening race of the Belgian calendar. At Ghent-Wevelgem weeks later, Farrar finished ninth, a disappointing result considering how well the race suits him. A week later though, he took fifth at the Tour of Flanders, confirming his potential as a future Ronde contender. In between, Farrar and Britain’s David Millar won stages at the Three Days of De Panne—Millar won the overall and would go on to be one of the main protagonists at Flanders as well. Four days after Flanders, Farrar won the Scheldeprijs, a Belgian semi-classic traditionally known to favor sprinters. Farrar has now spent two seasons winning the races he been expected to win—in 2011, the bar will be raised. Meanwhile, Garmin’s Ardennes contingent was down in Spain riding itself into form in the Basque region. Rookie Michael Kreder took second at the GP Indurain to open the week, while Ryder Hesjedal (following his sixth-place at the Volta a Catalunya) took third in Stage 1 of the Volta al Pais Vasco. Hesjedal and Daniel Martin would end the race in 11th and 14th respectively, impressive results considering they were riding against some of the best riders in the world on tough terrain. This same group then travelled north to contest the Amstel Gold Race and the Ardennes Classics. At Amstel, Hesjedal officially announced himself as a rider to be reckoned with in 2010, finishing second to Belgium’s Philippe Gilbert. He then finished ninth at Fleche Wallonne and 12th at Liege-Bastogne-Liege, capping a successful week for the Canadian. After the Ardennes, the squad mixed and split, sending teams to the Giro d’Italia and the Tour of California. At the Giro, Farrar won two stages, Julian Dean placed well in a couple, and Daniel Martin showed some glimmers of the grand tour potential we’ve all been expecting from him. Meanwhile, in California, Garmin and HTC-Columbia took the race right to Radio Shack’s Levi Leipheimer. 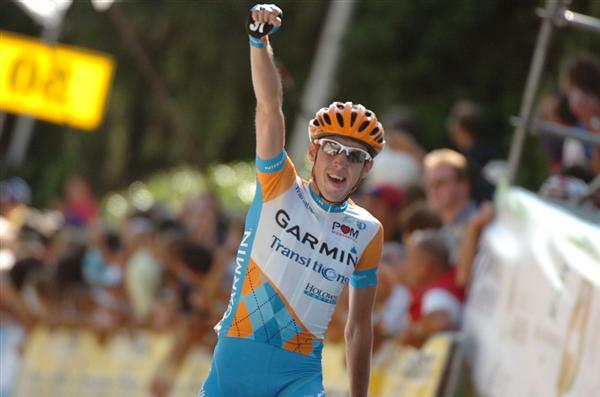 David Zabriskie won Stage 3 on his way to finishing second overall, while Hesjedal took the win on Stage 8. At the Tour de France, Jonathan Vaughters once again proved adept at finding top-10 contenders in the most unlikely places as Ryder Hesjedal held his own from the pavé through the Tourmalet to finish seventh in Paris. From there, the Canadian continued his run through the Pro Tour, taking sixth at the Classica San Sebastian, fourth at the GP Quebec, and third at the GP Montreal by the end of the season. As for Farrar, he rebounded from a disastrous Tour to take a repeat win at the Vattenfall Cyclassics and then a second-place finish in Plouay at the GP Ouest France. Then it was straight to the Vuelta for the American—his third grand tour of the season—where he won two stages. Tom Danielson, a rider who might as well stay in Spain for the rest of his career, finished ninth overall. As for the riders who did not race the Tour for Garmin, they enjoyed successful summers as well. Foremost among them was Daniel Martin. The Irishman finished third at the Brixia Tour, won a stage and the overall at the Tour of Poland, and then won the Tre Valle Varesine. He performed well during the season’s final month as well, scoring a second-place at the Giro dell’Emilia and a win in the final important race of the year, the Japan Cup. And don’t forget Svein Tuft and Jack Bobridge—they won stages in Denmark and the ENECO Tour, adding more wins to Garmin’s summer haul. But despite all of these successes, 2010 was not a season without its disappointments for Garmin-Transitions. Paris-Roubaix was a race where the team had hoped to perform well, but Farrar, Millar, Maaskant, and Vansummeren all failed to score high results. At the Tour de France, the team once again failed to take a stage—no thanks in doubt to the crash that broke Farrar’s wrist on Stage 2. And Christian Vande Velde? Well, let’s just say he spent more time on x-ray tables than podiums this season. Overall, Garmin-TRansitions ended the season with 27 wins including 4 grand tour stages, 5 Pro Tour wins, and several important one-day races and semi-classics to boot. And next year, with the addition of riders like Thor Hushovd and Heinrich Haussler to the mix, there’s little stopping them from winning even more in 2011. Most Valuable Rider: Tyler Farrar and Ryder Hesjedal are the obvious choices here, but if I were a team General Manager, I’d be asking Vaughter how he much for Daniel Martin. If his first half of 2011 resembles his second-half of 2010, I’m not sure how much longer Vaughters will be able to keep the youngster out of the Tour de France. Biggest Disappointment: Tyler Farrar’s crash during Stage 2 of the Tour de France completely killed the team’s best hope for a stage win. With Haussler and Hushovd leading him through the final moments of this year’s stages, look for the American to take his first Tour stage in 2011. Biggest Surprise: I don’t care what you say, there’s no way you can say you saw Hesjedal’s top-10 finish at the Tour coming. As impressive as the result is, I hope he spends more of his time focusing on races like Amstel and the Ardennes classics. He’s better suited to them—and will have more or less the full backing of his team. That’s it for #7 in our countdown of the top-20 teams of 2010. Come back later for #6. This entry was posted in Featured, Teams and tagged D. Martin, farrar, garmin-transitions, hesjedal, season review, teams, vande velde, vansummeren, zabriskie. Bookmark the permalink. No mention of the Cervelo merger? A good question, Mike. I thought about it, but thought I'd save more of my thoughts for February's 2011 Season Preview. That said, it was certainly a big surprise, partially because it led Vaughters to jettison some of the sponsors that have backed him since the team's earliest days. Unfortunately, money rules all. The sponsors were probably dropped without the blink of an eye. Done in the name of the new team, new year, new personnel, new goals. Hopefully those sponsors don't abandon cycling for good. Vaughters of all people has been quite outspoken about the UCI and their rules which prevent sponsors from sticking around for multiple years. I am most curious to see how the roles/relationships play out between Haussler, Hushvod, Farrrar. Classics, sprints, it will be interesting to see who takes which role during which race. It would seem Hushovd was off his sprint game for a better part of the year, Farrar out kicked him a few times. In the WC stripes, does none of that matter? Hopefully Haussler can stay healthy of have results similar to 2009.